Amdro’s fire ant bait is excellent for covering large areas, such as a backyard. The bait is effective and can rid you of fire ants within a couple of weeks. While this packaging of this product can be difficult to open and use, the product itself is very effective and easy to put in place, attracting and kill colonies. Anyone who has ever had an ant problem in or near their house knows how tough it can be to get rid of the tiny insects. Considering that colony sizes can vary based on location and the types of ants, there is really no telling how many you’re dealing with in your unique situation. The ants you are noticing are more than likely worker ants. Once these ants find food, they not only bring it back to their colony and their queen, but they bring more workers back with them. A small number of ants can quickly turn into a big problem, which is why it is important to know how to exterminate them. There is a big difference between ant bait and ant sprays. Ant sprays work at the point of contact, killing only the ants that you see and spray. Ant baits work a bit differently, bringing all the ants from one colony to destroy the whole thing using poison. This poison will kill off far more ants than if you had just sprayed the ones you saw. Terro Liquid Ant Baits work to eliminate the whole problem, not just a temporary fix. Ant baits attract ants very quickly. The packs kill ants you don’t see as well as the ones you do see. They are easy to use – once you’ve placed them, you’re done. Packs are small and discrete. Affordable and available in different amounts. The product is not safe for human consumption and should not be used around small children. The product is not safe for animal consumption as well and is also not recommended for use around household pets like cats and dogs. Can be placed under appliances or other hard to reach areas. Filled with liquid product, these bait stations are designed to kill ants over a period of 2-3 days. The active ingredient in this ant bait works slowly as to allow the ants to return to their colony and share the bait’s location with the rest of the ants. The other ants in this colony will follow the trail left by their fellow workers and consume the same bait, and ultimately this cycle will continue until your ant problem is gone. 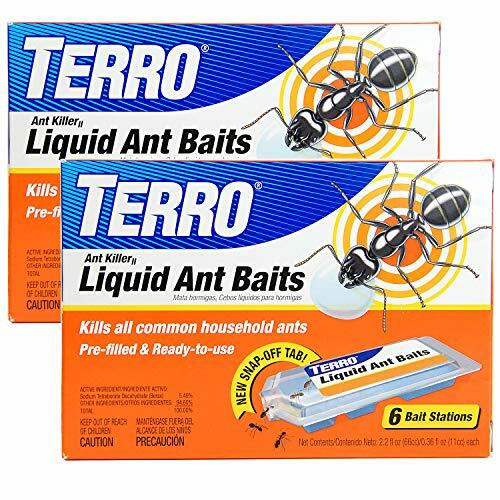 Terro Liquid Ant Bait is very easy to use. Users simply break apart each station and cut along the colored markers to open. Then, users can place the bait stations where the problem is most prominent or at a point of entrance, like a door or crack in the wall. Since a pack comes with six stations, you can place multiple bait stations if necessary. An ant problem is one thing. A fire ant problem can be cause for greater concern. While everyday household ants are annoying, fire ants are harmful and sting, causing sharp pains and burning. These stings go from painful to itchy and can be very unpleasant. 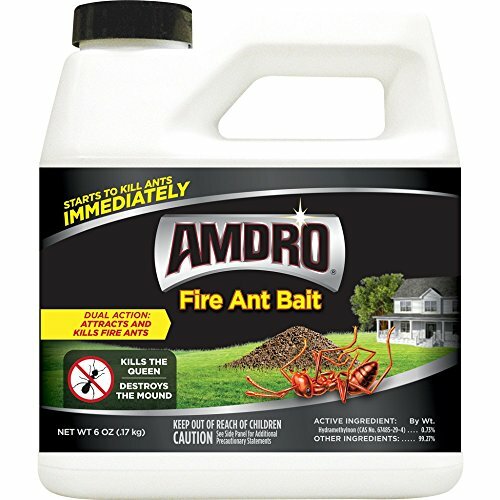 Amdro Fire Ant Bait Granules are great for effectively managing a fire ant problem, working to eliminate entire colonies of the attacking insects. Users are to spread the fire ant bait, which is in the form of granules, all over your yard. This method is good because even if you don’t know exactly where the colonies are, you can cover your basis and nail your culprits. If you do know where the colony or colonies are, you should still spread the granules over your entire yard. Amdro takes a two-step approach to fire ant control. Step two is to target your problem mounds. After you have spread the granules, spread extra granules where the colony mounds are. Amdro Fire Ant Bait is a great solution for infested yards, whether you know where the colony is or not. It’s good for season-long control and can take out colonies within two weeks. Terro Outdoor Liquid Ant Baits are simple to use—just open and place. Removeable stakes make it easy to keep cups in place within yards with grass and dirt. Delayed active ingredient allows entire colonies to be eliminated. Long-lasting cups ensure three months of protection. Liquid bait stations are weatherproof and can withstand rain and other outdoor factors. Users report that the bait works on fire ants and carpenter ants as well as household ants. Packaging can cause the product to become messy; users report it can be easy to spill if you are not very, very careful when opening. 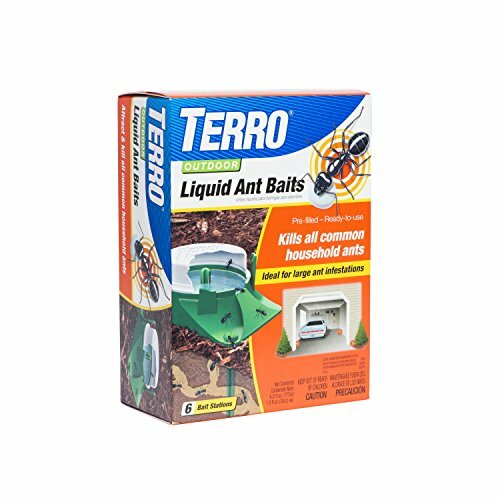 Ideal for large outdoor infestations of common household ants, Terro Outdoor Liquid Ant Bait includes six pre-filled bait stations that users can securely place outside the home. What makes these bait stations different from other bait stations is that they are completely weatherproof. They keep the liquid from drying out or being affected by rain, wind, etc. In addition to this feature, the bait stations come with stakes that you can press into the ground for more secure placement. Critters like squirrels and birds won’t be able to knock your bait stations out of place, and no one will accidentally kick it over. Like other baits, the liquid in these stations holds an active ingredient that slowly kills the ants—but not before they reach their colony and queen. While the bait station is attracting the ants that you have spotted, it will also bring out the ants you haven’t seen. In up to two weeks, the bait stations can have an entire colony wiped out. Easy to use, all you have to do is push down on the bait cup and twist it one-quarter of the way around. Either with or without the removable stake, place the station close to where you have seen ants entering your home. Users are advised not to move the cups, as the ants will return to the place they originally found them. For continual protection from these insects, replace the bait every three months. Maxforce Carpenter Ant Bait Gel works to target several kinds of ants, including Acrobat, Cornfield, Honey, Pharaoh, and more. The sweet taste of the gel works to attract specifically carpenter ants. The gel can easily fill in small crevices and cracks where ants can enter homes. Delayed poison ingredients work to attract colonies and kill more ants. Maxforce gel works quicker than other baits, ridding users of problems in three to five days. The gel is best for small areas, so it’s not a good product for larger problems. One tube is a little pricey. 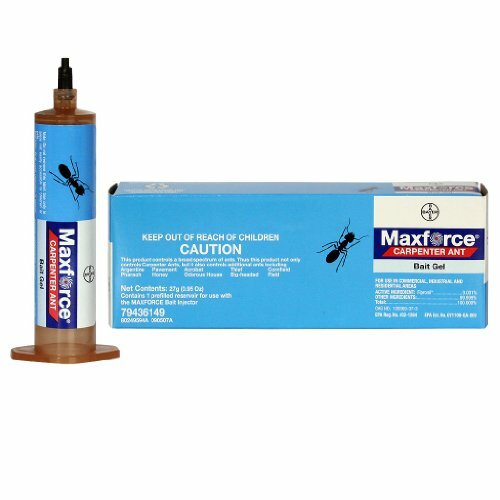 Maxforce Carpenter Ant Bait Gel is a sugar-based bait that uses a high moisture content to attract carpenter ants. Maxforce promises fast action with an estimated three to five days until your ant problem is under control. Carpenter ants generally prefer a sweeter diet, so this gel works well to attract them and keep them coming back. The ants unknowingly ingest the sweet poison, which works slowly while they lead the rest of their colony back to the spot. Users can place the gel in cracks or crevices where they see ants getting into their house. It can also be used in other small areas such as cabinets, drawers, and pipes. Harris uses Borax, which is a naturally occurring mineral instead of a chemically developed ingredient. Harris is an EPA registered company, meaning they care about environmental safety. Borax works like other active ingredients used in baits, slowly killing the entire ant colony. Bait trays are easy to use. The bait will attract and kill several different kinds of household ants. The bait sells at a very affordable price. Harris Borax bait does not work on other ants, such as carpenter ants. Some users reported the bait works better without the use of the included tray. 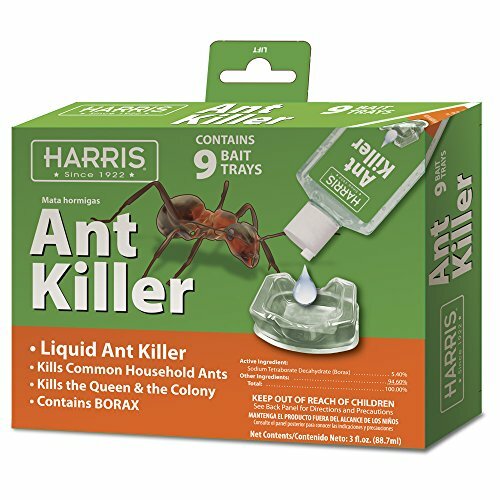 Harris Borax Liquid Ant Killer is intended to fight and kill off common household ants. Like other baits, this bait works by feeding the worker ants and sending them back to poison the entire colony, including the queen. In turn, this bait kills the source of the problem. The main active ingredient in this bait is borax, which is a naturally occurring mineral powder. Borax works the same as other baits’ active ingredients, slowly killing the ants, so there’s plenty of time for them to retrieve their friends. Harris Borax bait is EPA registered for both indoor and outdoor use and can attract and kill any sweet eating ants, including Argentine ants, Pavements ants, and Acrobat ants. Unique design keeps the stations in place and protects them from the sun and small children. Compartmental design allows users to try two different products at once for better results. Green coloring makes these stations more discrete. The tamper-resistant lid makes this product safe for use around children and pets. They are easy to use and move around. Users report they are very durable. Users have to purchase their bait separately, as these stations are not pre-filled. 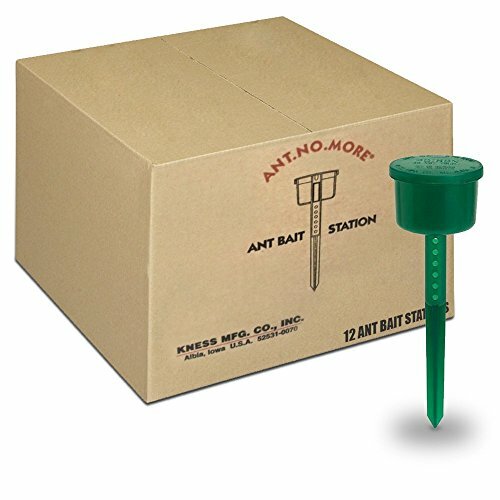 Kness Ants No More ant bait stations come in sets of 12 stations posted on top of a stake, which users can press into the ground for secure placement. These stations are in the form of cups that have two different compartments. One if for granular bait, and the other is for liquid bait. The two compartments allow you to use two different kinds of bait simultaneously, potentially attracting more ants and destroying more colonies. The bait stop located on the inside of the station keeps the bait from spilling out, while smell entry holes let the ants reach the bait. Kness designed these stations with safety in mind. Their tamper-resistant lids are designed to prevent accidental openings, like those from small children. To keep your bait active longer, the stations are also UV resistant. These stations are great for around homes and other buildings. Ant invasions are fairly common occurrences, but they can be hard to understand and conquer. That’s why we have created an FAQ section to address frequently asked questions regarding ant problems. Read on to receive a bit of extra advice. An ant colony is a home that ants build and live in together. Additionally, a colony is also the social organization that ants follow. You have probably seen many ant hills in your life. It’s true that these any hills contain colonies. However, a colony is much more than just the hill. Anthills are just the entrance and exit. The actual colony is made up of underground tunnels. These tunnels can go on to be as deep as 25 feet. Every colony has a social structure, where the queen ant is the leader and founder. The queen ant will lay thousands of eggs in her lifetime. From these ants can come drones, workers, and alates. How Many Ants are in a Colony? Depending on the species, location, and timeline, ant colonies will vary in size. Queens can live up to 30 years, which means that if her colony goes undisturbed, it can grow to great sizes with thousands and thousands of members. Fire ant colonies are known to have tens of thousands of ants. Fire ants, along with some other species, can form “supercolonies,” which consist of multiple nests, queens, etc. and can contain millions of ants. However, colonies found in your backyard could be brand new and house just a couple hundred ants. There are a few different kinds of baits that are effective in getting rid of ants. Some ant issues can be more difficult to tackle than others. If you find that you only see a few here and there, or you happen to catch them coming in through a crack or crevice, it’s likely that your ant problem is still outside. In this case, it’s best to use outdoor bait products. These products come in the form of granules that you can spread throughout your yard or stations that contain either granules or liquid bait. If you see large amounts of ants in your home or spot them in long trails coming from inside a cabinet or the wall, you may have an indoor nest starting. Look for indoor bait traps, such as liquid bait stations or gels. Certain baits are designed for indoor use and will attract all the ants living inside. The first rule of thumb for preventing ant issues is to keep a clean household. This is especially important in areas that food is stored and prepared. Keep your floors and countertops clean, free from spills, crumb, and sticky substances. Make sure you empty your garbage can regularly. Keep your food in tightly sealed containers and bags. Don’t leave dirty dishes out for extended periods and run your dishwasher consistently. Additionally, try to keep ant pet food on a raised surface as to not attract the unwanted insects. Weather seal is a good way to eliminate gaps in doors and windows where ants frequently get in. A good idea is to use caulk around pipes and faucets, as these gaps provide access to wall voids or even the outdoors.